Where Is All the Dark Energy and Dark Matter? An artist's impression of the experiment to detect chameleon dark energy particles. Cesium atoms are dropped above an aluminum sphere, while sensitive lasers measure the forces on the freefalling atoms. Two experiments on Earth are helping to shine light on the hidden characteristics of dark energy and dark matter — elusive phenomena that make up nearly 95 percent of the universe but remain hidden from direct detection. The new dark matter and dark energy experiments narrowed the realm where the mysterious material can lie, thus helping scientists to better understand the strange stuff that, together, constitutes the majority of the universe. In 1998, scientists used NASA's Hubble Space Telescope to determine that the universe is expanding faster each year — an unexpected result. They concluded that a source of energy, dubbed "dark energy" because it remains unseen, is responsible for the push. The elusive energy makes up about 68 percent of the total energy of the universe. A number of experiments have sought to unravel the mysteries of the hard-to-find energy. Some suggested that dark energy is woven into the very fabric of the universe, while others thought it could be represented by any number of hypothetical particles. In 2004, theorist Justin Khoury, of the University of Pennsylvania, suggested that the reason dark energy has not been directly detected could be that it is hiding. The atom interferometer used to search for chameleon dark energy particles. When Hamilton read an article by theorist Clare Burrage, of the University of Nottingham, last year on how to detect chameleon particles, he wondered if an instrument built by Muller to detect gravitational anomalies by studying the difference in phase between atomic matter waves along different paths would be able to detect dark energy. Hamilton and his colleagues dropped cesium atoms above an aluminum sphere 1 inch (2.5 centimeters) in diameter, and then used sensitive lasers to measure the forces acting on the atoms while they were in free fall. Muller said the instrument "is one of the most sensitive ways of measuring forces." Because dark energy only interacts with the outermost layers of objects, using atoms in a vacuum should allow the team to determine if dark energy interacted with the atoms. The experiment detected no forces other than Earth's gravity. Although the nondetection might seem discouraging, it helped in the ongoing process of characterizing dark energy, ruling out chameleon-induced forces a million times weaker than gravity, as well as several other possibilities. According to Muller, the experiments are now between 10 and 1,000 times more sensitive than previous experiments. "Improving it by another such step would either definitely rule out the chameleon model — and lots of others — or detect them," he said. "Chameleons can't 'hide' indefinitely, and so if dark energy takes this form, we'll either know soon or definitely know that it isn't the case." Most scientists think dark matter is composed of weakly interacting massive particles, or WIMPS, so most direct-detection experiments are searching for signs that their detectors are affected by these unusual particles. Scientists expect that the massive particles would interact primarily with the nucleons — one of the types of particles making up the atomic nucleus — of the detecting material, creating a signal known as a nuclear recoil. However, none has spotted any signs attributed to dark matter. However, some experiments are searching instead for an annual variation in the number of detection events, due to the velocity of the detector as the Earth orbits the sun each year. One of these is the DAMA/LIBRA experiment in Italy, which in 2013 reported the observation of a signal that could be attributed to dark matter. Because other experiments are searching for nuclear recoil rather than annual changes, no other studies have been able to confirm their results. The lack of nuclear recoil in some experiments, combined with the results by the DAMA/LIBRA collaboration, provoked some scientists to question whether dark matter might interact predominantly or exclusively with another part of the atom. But some scientists wondered if dark matter might prefer to interact predominantly or exclusively with the outermost orbiting particles of the atom — the electrons — rather than those in its heart. "Then all these experiments would be basically throwing away their dark-matter signal, treating it as background," said Mayra Cervantes, of Perdue University in Indiana. Cervantes is a member of the Xenon Collaboration, an international group of scientists searching for dark matter. 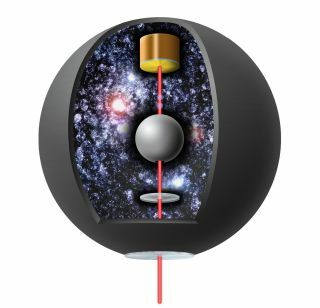 The XENON100 experiment differentiates between nuclear recoils and electron recoils, allowing scientists to search for a dark matter particle that interacts with electrons. Although the Xenon Collaboration did not directly detect dark matter, it was able to rule out characteristics of other models based on their lack of detection. "In this search, we excluded a variety of models," Cervantes told Space.com in an email. "That's a very important step ahead, because it tells us where the dark matter is not, and that, for sure, will open new directions to continue our searches." At the same time, the sensitivity of instruments searching for WIMPS continues to improve. "It is still possible that the dark matter is more or less what we imagine: a WIMP that would interact with the nucleons of our detector," Cervantes said. "However, the interaction could be very feeble, so our detector needs to be more sensitive to be able to see this dark matter." The results of both experiments, along with an accompanying News and Views article discussing their implications, were published online today (Aug. 20) in the journal Science.